Among the many types of mortgages available today, the VA mortgage is unlike the many private loans most banks offer. The VA (Veteran Affairs) loan offers low mortgage rates and aggressive underwriting, requires no down payment or mortgage insurance, and qualifying is usually very easy. 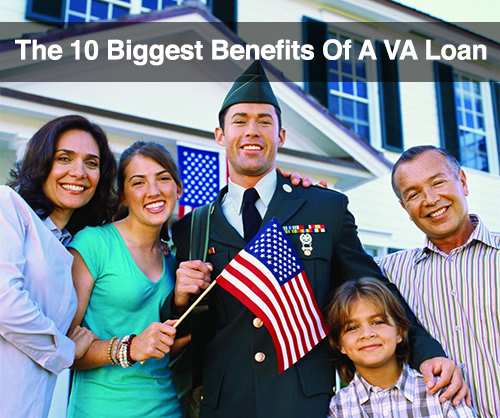 Here are just ten of the biggest advantages of a VA loan. Unlike almost all the conventional home loans out there, a VA mortgage requires no down payment. Instead of laying out up to twenty percent (or more) of your home’s cost up front, a loan from the VA lets you finance 100 percent of your home’s price. Most lenders require a buyer to pay for mortgage insurance to guarantee they receive their money even if the borrower defaults. The VA, however, does not require you to buy mortgage insurance, saving considerable money both at closing and over time. VA loans can waive mortgage insurance and down payments because the U.S. Government guarantees the loan, protecting the lender. With this solid backing, lenders are willing to make these highly attractive loans available to homeowners. Since the Department of Veterans’ Affairs doesn’t originate, fund, or set interest rates on these loans, every bank is free to set its own rates and fees. This allows you to compare offers from competing banks and select the loan best suited to your budget and situation. Many loans charge you hefty penalties if you pay off your loan early, but the government prohibits these penalties on VA mortgages. Thus, if you sell your home and pay off the mortgage, there’s no penalty. In addition, you can re-finance your loan at any time without penalty, either into another loan from the VA or through a private lender. These government-backed loans offer a vast range of options. You can have a fixed-rate or variable-rate mortgage. The loans can be used for any type of residence: single-family house, condo, duplex, manufactured home, and others. It can even be used to re-finance existing homes, make repairs, and improve energy efficiency. Every lender wants to ensure you have a good credit history and can pay the mortgage. Because the government backs these loans, banks will accept much lower credit scores and incomes for a VA mortgage than for conventional loans. The government limits how much a lender can charge at closing, saving hundreds or even thousands of dollars. Like most loans, VA mortgages do charge an up-front fee based on the loan amount, size of your down payment, and other factors. Unlike conventional loans, however, banks can roll this fee into a VA mortgage, so you don’t have to pay cash at closing. More importantly, most lenders waive these fees for certain veterans and some banks don’t collect it from any borrower. Almost all VA mortgages can be transferred to someone else if that person qualifies. This gives you a huge advantage when selling your house—you can include great financing as part of the deal, making your house very attractive. If you have any connection to the U.S. military and are looking at buying a home, you should check your eligibility for VA loans to learn more about their amazing benefits.